The drawing shows the lovely brick building, now called “Chequer Court”, with Braithwaite House behind. 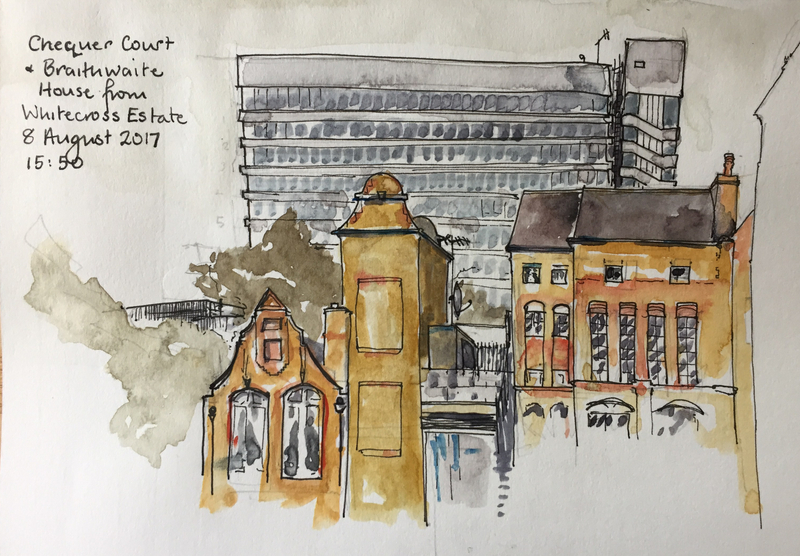 I drew the picture from Whitecross Estate East, in a quiet courtyard off Chequer Street. A record three people came to talk to me. Arabella was tending her garden flowers in pots and crumbling wooden boxes, on the other side of the courtyard. She came over and told me that the brick building used to be the community centre. She had done oil painting there. Previous to that, it had been a school. She described the marvellous high windows, and large rooms. There was a café. She said that underneath the square was all hollowed out, for bomb shelters. Construction work was going on behind us. “They have demolished the pram sheds”. Arabella was irritated that, in doing so, they had strewn rubble over the planted boxes. Another woman approached me much later. She also remembered the community centre. She did yoga there. “It was only 20 years ago.” She was concerned lest I was the harbinger of “another plan”. “No,” I said, “Not another plan. Just a drawing.” I showed her the drawing, to reassure her. As I packed up my things, a third woman came to say hello. She wanted to see the drawing, and said it was very good. Her small white dog tugged at her and slowed her up as we walked. Eventually he stopped her altogether and I walked on. Later, online, I found the plan to which the second woman referred. There is a plan by Islington dated March 2017 to improve the public areas of the West and East Whitecross Estates. The brick building was indeed a school. It seems to have been known as Northampton Secondary Technical School, which was in existence in 1924, and certainly up to the early 1960s. Searching online I found references to a “Bunhill Row Chequer Street Council School” whose records, 1928-1933 are in the National Archive, Kew ref ED 21/34646, but no further details. In 1998 “negotiation was completed for the sale of the Bunhill Row site for £22 million” according to “City and Islington College, the First 20 years” by Tom Jupp and Andrew Morris. Now it is luxury flats, and is called Chequer Court. It has now had all its cladding removed. About 2hr 15min, including conversations. Drawn and coloured on location.